The fiery and impulsive Leader of the Twelve, Peter is easily recognizable by his white, short, curly hair and beard. He is often shown holding a scroll, which may have words taken from one of his Epistles written upon it. In some icons he may also be shown with keys hanging from his belt, a reference to the words Jesus said to him: “And I will give unto thee the keys of the kingdom of heaven: and whatsoever thou shalt bind on earth shall be bound in heaven: and whatsoever thou shalt loose on earth shall be loosed in heaven.” He is often found in Icons with St. Paul, who were both martyred in Rome, holding together the Church, and showing their shared pre-eminence among the Apostles. There are two common depictions of the Apostle John: as the “Beloved Disciple” and as “the Theologian”. The former Icon is of the young Apostle John – the John who rested upon the breast of Christ during the Last Supper. In any icon showing scenes from the life of Christ (e.g. the Transfiguration, the Crucifixion) or those depicted in the Acts of the Apostles (e.g. the Ascension or Pentecost) then St. John is shown as the beardless brown-haired youth, little more than sixteen years of age. When John is painted in a “portrait”, rather than as part of a Biblical scene, then he is usually shown as the elderly John “the Theologian”. This is the John who, sixty years or so after the Resurrection of Christ, is exiled upon Patmos and writing both the Gospel of John and the Book of Revelation. He is shown with long white beard and high forehead, holding the Gospel book which led to his title “the Theologian”, often shown open to reveal some verses from the book. He may also be shown with an Eagle, the symbol of both John and his Gospel. Like John, St. Matthew also authored a Gospel account, and so likewise is usually depicted holding a large Book. Whether in portrait or in Icons depicting Biblical scenes, Matthew has long, wavy, white beard and closer-cropped hair. As a deliberate anachronism to aid identification, he may also be shown holding the Gospel Book in Icons with Christ depicting Biblical scenes. Matthew may sometimes be shown with a winged man, the symbol associated with his Gospel. Andrew, the brother of the Apostle Peter, was formerly a disciple of St. John the Baptist. Because of this, Andrew is depicted with long unkempt hair, in the manner of the prophet he followed. This makes him one of the most recognizable of Apostles when depicted in scenes showing Jesus’ earthly ministry. Andrew holds a small scroll not to indicate he authored any famous works, but to identify him as a preacher of the Gospel, “one who is sent out”, i.e. an Apostle. Bartholomew, also known as Nathaniel, is shown as a middle-aged man, with short beard and hair. He is also shown holding the scroll of an Apostle. After his martyrdom, St. Bartholomew has appeared to a number of people in vision and dream, so his appearance can be deduced. He has appeared to St. Joseph the Hymnographer, blessing him that he might be able to sing spiritual hymns, saying, “Let heavenly water of wisdom flow from your tongue!” He also appeared to Emperor Anastasius I (491-518) and told him that he would protect the new town of Dara. Not to be confused with St. Peter, who was previously named Simon bar-Jonah, the Apostle Simon was from Cana, and is the bridegroom of the famous Wedding at Cana. He is always shown with grey curly hair and beard, though with a higher forehead than St. Peter. The Apostle Thomas is most famously known as “Doubting Thomas”, on account of his refusal to believe the accounts of the other disciples that Christ had risen. Often maligned for this, in Orthodox teaching it is recognized that through his initial doubts, Thomas came to confess Jesus Christ as “Lord and God” – a greater confession of faith than any of the Apostles had previously uttered. Sometimes this confession of faith is held in Thomas’ hands in icons depicting him, though more commonly it is the scroll denoting his rank of Apostle that is shown. The most striking thing about the Icons of Thomas is that he is shown as a beardless youth, a teenager as John was. This is a consistent feature of how Thomas is shown in icons, as in this Icon of Thomas touching the wounds of Christ. The youthfulness of the Apostle Thomas is something worthy of consideration when thinking about his “doubts”. There are two Apostles named James. The son of Zebedee is the James often nicknamed “the Greater” in the West. This is largely because among the Twelve he was part of the “inner-circle” which also contained St. Peter and St. John. The Apostle John is also the brother of James and together they were known as the “Sons of Thunder”. James is shown with medium length brown hair and beard. Though often difficult to identify by sight alone in Icons of the Twelve, he is recognizable in the bottom-right of this Icon of the Transfiguration, which along with the young John and curly-haired Peter, James was privileged to witness. He is depicted as a young man (short beard, not white) in all icons, as he never got to live to an old age, being martyred a little over 10 years after the Resurrection. Jude is also sometimes called Levi or Thaddeus, and “Jude” is sometimes rendered Judas. Nevertheless, he is not to be confused with the Apostle Matthew (also called “Levi”), St. Thaddeus one of Jesus’ seventy disciples, or especially Judas Iscariot. The author of the Biblical Epistle which carries his name, the “Apostles’ Scroll” in his hand may sometimes show a quote from his own writing. Otherwise, St. Jude is identified as a mature man with curly brown (sometimes grey) beard and hair. As he was related to Jesus Christ through Joseph, husband of Mary, the appelation “brother of the Lord” (or “adelphos” in Greek) may be found on Icons. The son of Alphaeus and the brother of the Apostle Matthew, James is shown with brown wavy or curly hair and a pointed beard. He is not to be confused with St. James “Adelphos”, which means “brother of the Lord”. In iconography, the two Jameses are easily distinguished, as “the brother of the Lord” is always shown in the robes of a bishop, being the first bishop of Jerusalem. Here is an Icon of James Adelphos. Holy Tradition and Scriptures maintain that the Apostle Philip was well versed in the Old Testament prophecies, and eagerly awaited the coming of the Saviour. He immediately responded to the call of Jesus, and recognized him as the Messiah (John 1:43); and subsequently led Nathaniel (the Apostle Bartholomew) to become a follower of Jesus too. Therefore it is remarkable to come into contact with icons of the Apostle Philip – who is always shown as beardless youth. Like the youthfulness of Thomas, it is something worthy of consideration. Matthias is the disciple of Christ who replaced Judas Iscariot as one of the Twelve Apostles after the latter’s betrayal and suicide. His appearance in icons is entirely in keeping with what is known about him. Schooled in the Law by the Prophet Simeon, who received the infant Christ in the temple, Matthias was already a man of maturity before becoming a disciple of the adult Christ. By the time of his martyrdom in 63A.D., Matthias would be the elderly man depicted in Icons of him. Whilst Judas is obviously not a saint, and isn’t shown in icons of “the Twelve”, he is nevertheless depicted in icons of the Last Supper or else kissing Christ in the Garden of Gethsemane. In icons of the Last Supper he is easily recognizable as the one dipping his hand into the dish, thus revealing his future betrayal of the Lord. Often, the Apostles are not shown with halos in scenes prior to Pentecost, but needless to say when they are shown with halos, Judas is conspicuous by not having one. Whatever it may be worth – and it may be worth nothing – in Orthodox Iconography Judas is almost always shown beardless, like John, Philip, and Thomas; thus, like them, he was perhaps still a teenager at the time he betrayed his Saviour. This entry was posted in The Saints and tagged St. John, St. Paul, St. Peter, Stylism, The Apostles, The Twelve. Bookmark the permalink. is there an italian version of this site? No, I’m the only person writing for this site, and I don’t know Italian! I’m interested in Bartholomew….Can you tell me how is his martyrdom usually depicted in the orthodox tradition? … instead they are shown holding a cross. Bartholomew is more likely to be shown holding a scroll, as this represents Apostolic rank, which is what he best known for. I don’t think iconographic depictions of Bartholomew’s martyrdom are common, however written descriptions of his death are: he was crucified upside-down in Armenia, then had his skin flayed, and was beheaded. Can I take it that the tradition of not showing the instruments of martyrdom does not apply to frescos? I’ve seen plenty of wall paintings depicting the various martyrdoms of St,George. I note your point about the appearance of the instruments of martyrdom in later, western, paintings and this ties in to a certain extent with what i was told about Bartholomew -that the Orthodox tradition has him crucified and the Latin tradition has him flayed.The reason I raised the question is that I’ve come across a fresco here in Crete which shows Bartholomew carrying his flayed skin across his back, The church and fresco concerned appear to be 13th or 14th century i.e. the time Crete was under Venetian rule and I was wondering why an Orthodox church would contain what appears to be a single Latin image. The tradition of not showing instruments martyrdom only applies to “portrait” icons – i.e. Icons of a Saint used in icon corners for private devotion, or used in an iconostasis. Such icons will usually be a full-frontal, or half-profile of the Saint and have the Saint’s name inscribed on it. These icons can be likened as family portraits, and so show the Saint as they are, not how they were: in heaven, in glory, with only the cross (for martyrs) to represent the manner of their death. Depictions of the **historical event** of a Saint’s martyrdom is a different affair altogether. These are usually found on frescoes, as you say, but they aren’t confined to church walls (illuminations in manuscripts are another common source). Here, the martyrdom is shown in a more realistic way, with instruments of execution and torture; these depictions might be inscribed with “The Martyrdom of St _____” as opposed to merely “St ________”. 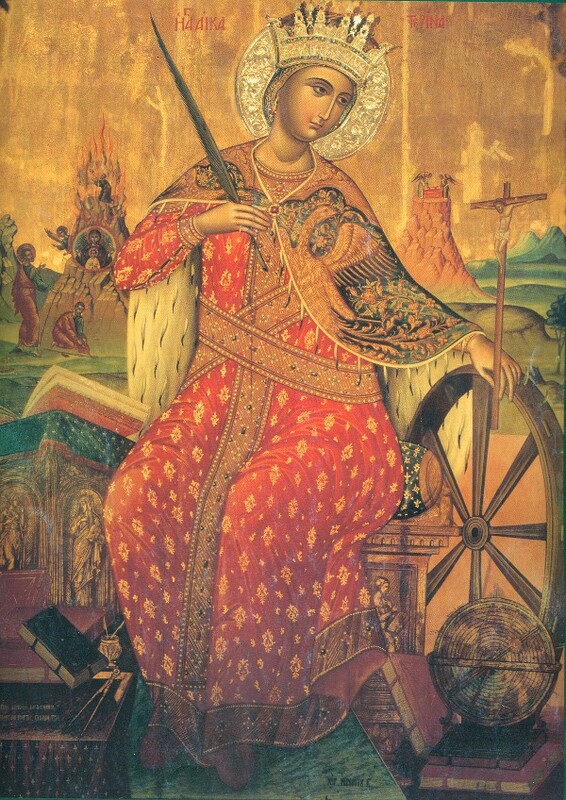 … here St Catherine is shown with “her” wheel of martyrdom; and it’s from an iconostasis! What you have seen of St Bartholemew is another example which I hadn’t heard of before. Hello – perhaps you’ve answered this elsewhere, and I’ve just not come across it yet: in icons of the Twelve, Paul is usually present, even though historically he was not of that number. I assume he takes the place of Matthias in the count? Does this imply anything about St. Matthias’ position or acceptance as an Apostle? Somewhere along the line in my reading years ago — and it would have been a conservative Protestant or Mennonite source — I came across the idea that since the Eleven used the drawing of lots to choose Matthias, God didn’t fully approve of their choice, and so he had to get St. Paul converted to really take the place of Judas. I have no idea how prevalent or old that idea is. It’s true that St Matthias often gets “bumped” from icons of the Twelve in order to show Paul. Another example would be the icon of Pentecost (https://iconreader.wordpress.com/2011/06/14/pentecost-icon-as-an-icon-of-the-church/) where Peter and Paul are centrally placed in the icon; depictions of the Twelve flanking Christ on icon screens will also invariably include Paul. I think the reason is to do more with St Paul’s importance as Apostle and author of the Scriptures, than any besmirching of St Matthias’ character (Luke was also a companion of Paul, and when you take Luke and Paul’s writings together you have the majority of the NT canon right there). Bringing faith to heathen lands! 1) To avoid favoritism, and to show that Peter – who suggested that Judas should be replaced – was not seeking to appoint another in an autocratic way, despite being “Chief” of the Apostles. 2) The disciples had not yet received the Holy Spirit at Pentecost (which might be an argument against the Mennonite/Anabaptist practice which continues something that should properly have ended after the coming of the Holy Spirit; the practice now of choosing bishops would be conciliar, relying on the guidance of the Holy Spirit, rather than by lot). Yep… good information. Thanks for taking the time to reply. I am trying to identify a Saint on an Icon I recently viewed online. The image was of the Mother of God and had St. Seraphim of Sarov written in the lower right corner and a Saint I do not know in the lower left corner. This unknown (to me) Saint had a long white beard and was holding a long unrolled scroll that reached to the ground. Unfortunately, when I clicked on the link it didn’t allow me to see any picture so am unable to identify the Saint. If you can message or friend request me on fb, I can copy the image of the icon to you. Your blog reply will not allow me to copy and paste it here. Your blog here is absolutely wonderful. I have shared it on my wall. And you forgot the “Apostle to the Apostles” whose feast day is today. Therefore it seems the text above St John is “Lord, who will betray you?”, which is a slight paraphrase of his reply in John 13:25. It’s difficult to read because the word for “betray” is split over two lines. I’ve written here so that anyone with better Greek can correct any mistakes. A few years ago I was visiting a monastery in Greece and purchased a small icon. I can´t tell what saint it is – it shows a man standing by a tree, holding two fruits in his hand. Does anyone know who it is? It could be Euphrosynos the Cook, though it’s difficult to know without seeing the icon. Thanks! That looks like the icon I have. After posting this article I saw your comment again and your comment about the tree struck me. As St Irene is shown wearing the garb of an abbess, she could be mistaken for male, beardless, ascetic if the icon is small or there is some damage to the image. Is there a similar guide to the depictions of the evangelists? Not yet, but it is a good idea for a future article. ..from left to right, the Saints’ names are “Basileios” (Basil the Great), “Chrysostomos” (John Chrysostom) and “Grigorios” (Gregory the Theologian). It’s a nice example of the icon that is practically identical in composition to the one in the article, even though the style is different. Thank you so much for clearing that up for me! I guess I cant tell the difference beteween Greek and Russian. I intend to give this as a gift to a friend in the OCA, and now at least I can tell him who the saints are. Hi, on reading about the icon of simon Something rather interesting stood out. it’s Simons wedding and is it reliable source. I am so enjoying all this information – thank you iconreader. In the selected images of the various disciples I notice some face left, some right, some are face on, some looking slightly downwards – is there significance here – and if so, can you help with what it is? Thank you. 1. What is the origin of the icon of the young St. John the Theologian presented above? I do not wish to cause divisions here; but, it is very suggestive of a homosexual nature between him and Jesus Christ. I used to own a copy of this icon until I saw this trait and then I could no longer bear to have it at my icon corner; I had it destroyed. 2. Would you be willing to discuss St. Luke the Evangelist at some point in the future? Some Icons portray him as bald, meanwhile at other times with thick curly hair. I imagine that the baldness represents “great wisdom and learning”, just as you mentioned of St. Paul above. But I’d love to hear whatever you have to say about him. St. John (the Beloved Disciple) is depicted that way because he leaned on Jesus during the Mystical Supper. It was something common at the culture at the time. What is the meaning of the orange or red like narrow stripe on Jesus Christ clothes and also on the saints clothes, sometimes if the icon is full figure you can see it on the robe also from below? thank you in advance and God bless you for this informative site which is very helpful to learn more about icons. The orange or red stripe is meant to be a gold band, although in older icons this can sometimes have faded to give a different colour. It represents earthly authority and is a reference to the Prophet Isaiah who said of Christ: ” the Government shall be upon his shoulder” (Is. Ch 9), speaking of Christ’s authority over all things. ..which is not the most obvious place to talk about it!